Irv Smith bounced around the football world before settling in to become an All-Star defensive back. Smith went to Southern Mississipi and attended the New York Jets training camps in 1989 and 1990, but didn't catch on. 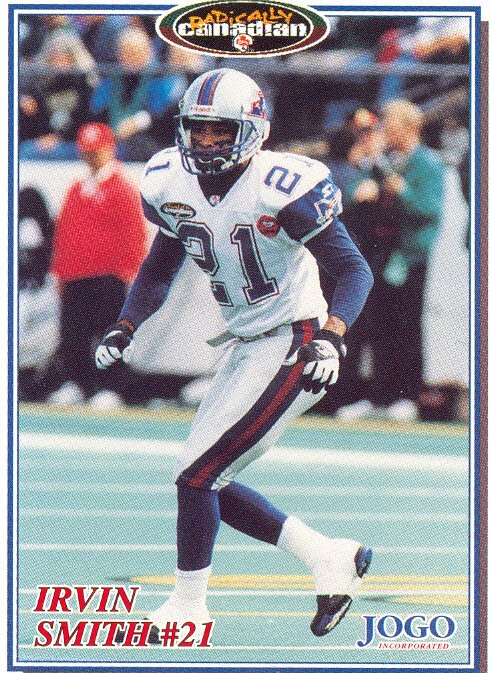 In 1991, Smith played for the London Monarchs of the WLAF (later NFL Europe) and also had his first try at the CFL with Hamilton, but was released before the season started. In 1992, Smith was back with the London Monarch and also had a stint on the practice roster of the Saskatchewan Roughriders, but neve rgot into a game for them. In 1993, Smith signed with the Washington Redskins of the NFL, was released and then had a tryout with the Minnesota Vikings. Smith made good on his third attempt to crack the CFL when he signed with the Baltimore Stallions in 1994. Smith was with Baltimroe for both 1994 and 1995, wining an East All-Star in 1994, a South All-Star in 1995 and CFL All-Stars in both years. Smith was with the Baltimore club when they lost in the Grey Cup in 1994 and won it in 1995. When the U.S. expansion ended, Smith came to Montreal with the relocated Baltimore team to reform the Alouettes in 1996. Smith played six seasons in Montreal, winning three more East All-Stars in 1996, 1999 and 2000. Smith had 31 career interceptions, with a career high of 7 coming in 1999.